The New Delhi-born Krishnamoorthi, a lifelong progressive, was always the front-runner in the race against Republican Peter DiCianni. They were vying for the seat vacated by Tammy Duckworth, who won Illinois’s US Senate seat. 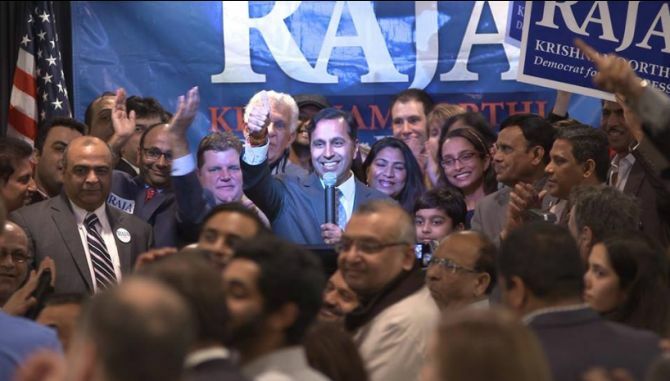 Even as America stood on razor’s edge over the Presidential election, the Indian-American community chalked up a win with Raja Krishnamoorthi’s successful race to the United States Congress. ‘Thank you! I’m honored and humbled to be the next Congressman of Illinois’ 8th District,’ the Democrat from Schaumburg, a suburb of Chicago, declared soon after the Associated Press declared him winner with most precincts reporting. He not only led in the polls but also the fundraising -- collecting more than 11 times as much money as DiCianni by the end of September, according to reports -- and the endorsement. On the eve of the election he was confident and buoyed by a second endorsement from President Barack Obama, this time on video, and the conservative Chicago Tribune. And the Tribune’s endorsement of Krishnamoorthi had nicely rounded off his impressive list of endorsements just before November 8. The newspaper had found his resume ‘a good balance of business, government and political experience,’ with his service as a former deputy treasurer for Illinois and assistant Illinois attorney general, along with his work as a small business leader now running two high-tech businesses in the national security and renewable energy sectors. And the trend did continue. In conversations with us, Krishnamoorthi had also emphasised the importance of Indian Americans participating in the political process. Krishnamoorthi will bring to the US Congress his experiences as issues director in President Obama’s successful US Senate campaign in 2004 when he helped shape policy proposals that Obama embarked on in federal office, as deputy treasurer of Illinois, as special assistant in the Illinois Attorney General’s public integrity unit, and an entrepreneur. Krishnamoorthi had said his plan would be fully paid for by cutting unnecessary military programs, including, but not limited to, littoral combat ships and the Osprey tilt rotor aircraft. He argued that this could free up tens of billions of dollars in the next decade that would be better invested in helping more students attend college. With regard to the Affordable Care Act or Obamacare, which is being slammed by Republicans and other critics since the premiums are expected to rise by more than 25 percent, Krishnamoorthi said he would work in Congress to tweak this legislation to make it work better for the millions of Americans who earlier had no health care insurance at all.